During the holidays, I often feel sorry for my wife who prepares most of our meals. The reason being is that preparing quality meals seems like such a painstaking and time-consuming process, while the actual enjoyment of eating lasts significantly less. So a couple days ago, to prepare our Christmas dinner, my wife was probably in the kitchen for a solid 3-4 hours, but actually sitting down to eat took maybe 20 minutes. I often offer my wife the out, that we can order out, but she won’t have it. For her, she wants to have that “Voila!” moment when her family takes that first bite, and she can see that all of efforts have culminated all of her loved ones happy and surrounded by great food. I think this “Voila” moment is what chefs live for. And that voila moment is “the Marriage of Supper of Lamb,” which the apostle John describes it in the following manner: “Hallelujah! For the Lord our God the Almighty reigns. Let us rejoice and exult and give him the glory, for the marriage of the Lamb has come, and his Bride has made herself ready; it was granted her to clothe herself with fine linen, bright and pure—for the fine linen is the righteous deeds of the saints. And the angel said to me, ‘Write this: Blessed are those who are invited to the marriage supper of the Lamb’” (Rev. 19:6b-8). 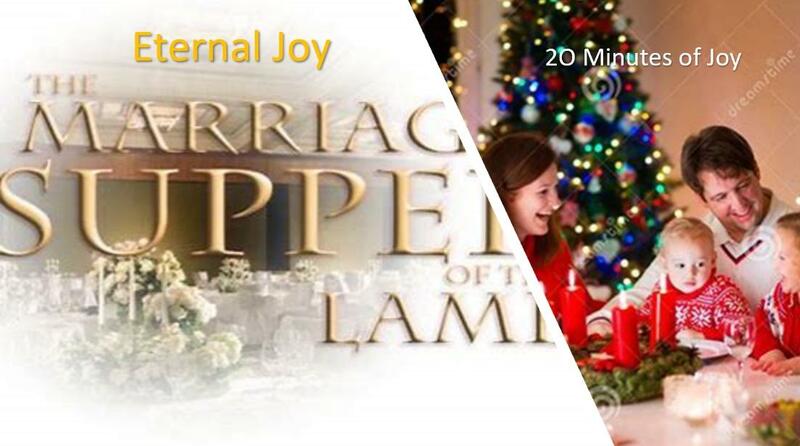 And the major difference between what happened at our dinner table and at the Marriage of Supper of Lamb is the “payoff”: the joy won’t last a mere 20 minutes like a holiday feast, but an eternity. What a blessing! Thank you, Jesus! Prayer: Lord, thank You that You are patiently making me more and more into Your image. Please allow me to submit myself to Your work and thank You for the person that I will one day be. What can we learn about boasting from this passage? And in what ways do we “boast”? What are the dangers of anger, fury, and jealousy? Taken together, vs. 5-6 give characteristics of true friends and enemies. What are they and how do you compare as a friend? Boasting, a form of pride should be avoided. The Proverbs writer shows the folly of boasting about tomorrow, much like James reminds us in James 4:13-16, because we have no control over the next day. Verse 2 implies that self-promotion is another form of boasting; let others compliment you. In vs. 3-4, anger and jealousy are compared to something heavy that we carry around us. Isn’t the imagery so true because anger and jealousy often feel like a weight that slows us down. Friends speak truthfully even if it is hard to hear sometimes. Enemies are like “yes men”, they may make you feel smart and good, but their words don’t help much. This morning we talking about the Lord’s patience with us and our slow transformation, and this afternoon we highlighted some potential areas of struggle, such as boasting/pride, anger, jealousy, and truthfulness. Are any of these areas you’d like to progress in? If so, remember transformation may be slow, but Christ is in it for the long haul.